Last Wednesday the 28th of June 2006, we got together to perform and entertain at the launch of a new gay newspaper called the Pink News. 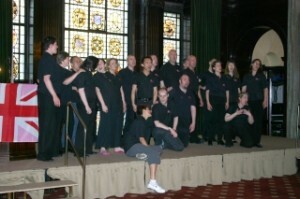 After rushing to get to the Law Society in time we did a really good performance, singing our hearts out to, as I understand, a very influential audience. Singing Sheer Madness is always fun (I don’t think I will ever get tired of singing that! ), even though we sang in two rows instead of the usual four, and I ended up all confused about the moves as I wasn’t standing in my usual place. Angels sounded great even without Mladen’s conducting and Tragedy is always a hit with the moves and everything. It can sometimes be a bit nerve-wracking and even frustrating to sing to an audience that isn’t really there to see us, but after the performance many people commented on how well we performed and I even heard that some were quite impressed. After Tragedy we enjoyed some bubbly as we listened to a few politicians, from different parties uniting in talking, among other things, about the importance of gay rights and congratulating the Pink News of course. We finished it off with a bang performing the James Bond medley, the girls being fabulous as usual with our plastic diamonds!